Strength - 8. An intense taste experience, the ideal blend for milk based recipes. Creamy and full-bodied. Suitable for all coffee makers.A blend of Brazilian Arabica and African and Asian Robusta coffees creates a full bodied and aromatic espresso, enhanced by notes of lightly spiced liquor and chocolate. Since 1895, the Lavazza family have devoted their lives to the pursuit of coffee perfection. True Italian coffee taste: our passion, your pleasure. 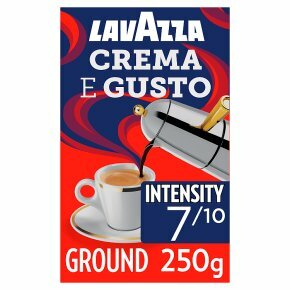 Suitable for all coffee makers Strength - 8 Italy's favourite coffee, Lavazza is synonymous with quality coffee all over the world, this comes directly from over a century of passion for coffee, experience, research and innovation.